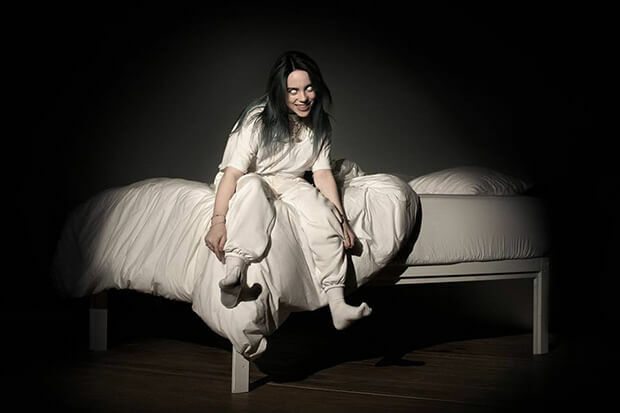 Billie Eilish faces her darkest fears and paints them in painstaking detail on her debut album, WHEN WE ALL FALL ASLEEP, WHERE DO WE GO?. In doing so, the 17-year-old phenom takes the next step on the path she has been paving since her breakout single “Ocean Eyes” went viral in 2016. Three years into her career, and she is yet to release a bad song. Her perfect record continues with the release of her first LP. Here, she comes very close to delivering a banger tailored for the clubs. Of course, there is a demonic twist. Over throbbing beats, she embodies a boy’s worst nightmare. “I’m that bad type. Make your mama sad type, make your girlfriend mad type. Might seduce your dad type. I’m the bad guy, duh” Billie chants. And her taunts get even more devilish after the beat switches out in favor of haunting giggles and bone-jarring bass. Cleverly written and instantly addictive, there’s a reason this has amassed more than 27 million Spotify streams in its first four days of release: it’s easily one of the best songs on the album. But it is more than just a declaration of sobriety. There is also a poignant expression of frustration and fear of losing loved ones. “I can’t afford to love someone who isn’t dying by mistake in Silver Lake,” she ironically intones. Moments of reflection like these set the rising star apart and elevate the final product so that it reflects more than just her inner workings. The mood and sonics switch again with the irresistible growl of “you should see me in a crown.” Months after its premiere, the self-assured menace is as dark and demanding as ever. It also offers a rare moment of well-deserved cockiness from music’s Next Big Thing. “You should see me in a crown. I’m gonna run this nothing town,” she threatens on the instant chorus. “Watch me make ’em bow.” One look at her incredible streaming numbers alone, and these claims are more than justified. Follow-up track “all the good girls go to hell” is another serious mood. On it, the stereotypical bad girl gets a chance to save the day. “All the good girls go to Hell. Cause even God herself has enemies,” Billie croons. “And once the water starts to rise, and Heaven’s out of site, she’ll want the Devil on her team.” The end result is a fitting tribute to the eternal anti-hero and houses some of Billie’s most pointed writing. Not only that, it all but begs for some sort of mash-up or joint performance alongside Ariana Grande’s “God is a woman.” Heaven and Hell have never sounded more feminist, nor have they ever sounded more appealing. Sometimes it is easy to forget that Billie is so young. She emotes with poise and grace beyond her years and creates with confidence rarely seen even in more established acts. However, she shows her age and bares some of her insecurities about love on the trio of songs that follow. It all starts with buzz single “wish you were gay.” Here, the streaming sensation tries to explain away a crush’s lack of response to her advances with the assistance of an active audience. And she can only hope for one explanation: he’s gay. If that’s not the definition of youthful clumsiness, I don’t know what is. Forget about any claims of gay-baiting or bashing. This is, at its core, an attempt to salvage what’s left of a teen’s heart after it has been bashed against a mountain of disinterest. She’s just as conflicted on the shadowy “when the party’s over.” Incensed by a lover, Billie considers calling it quits on their relationship as the production whispers and whirls under her graceful vocal line. “Nothing is better sometimes. Once we’ve both said our goodbyes, let’s just let it go,” she resolutely sings. However, the promise of peaceful solitude dulls when compared to reality. “And I could lie, say I like it like that, like it like that.” Thus, they’re left at a painful stalemate. If you need any evidence, look no further than “my strange addiction.” In between samples of an episode from The Office (her mind), Billie sings about being caught in a toxic embrace. “Learned my lesson way too long ago to be talking to you, belladonna,” she grudgingly admits. But, it turns out that she’s still just as addicted. “You are my strange addiction,” she coos. “My doctors can’t explain my symptoms or my pain. But you are my strange addiction.” Ironically enough considering its title and subject matter, this is one of the most addictive songs on the LP. I all but guarantee you’ll be humming along hours after a single listen. There’s another thematic shift with the final three songs. Emotionally, WHEN WE ALL FALL ASLEEP, WHERE DO WE GO? hits its lowest point on the sparse piano ballad “listen before i go.” The legitimate tearjerker showcases just how low depression sends you, with Billie appearing to illustrate the moment someone contemplates ending their life. “Take me to the rooftop. I wanna see the world when I stop breathing,” she pleads at the opening. Tension and desperation build as the song moves into its final moments. “Call my friends and tell them that I love them. And I’ll miss them. Sorry,” she ominously sings before the wail of sirens come in. It’s all but impossible to take a true breath while listening to the aching tribute. If you weren’t already ugly crying, I guarantee you will be after the one-two punch of “listen before i go” and “i love you.” On the latter, Billie struggles to come to grips with her feelings for a lover. “We fall apart as it gets dark. I’m in your arms in Central Park. There’s nothing you can say or do. I can’t escape the way I love you,” she fragilely sings. “I don’t want to, but I love you.” There’s a heartbreaking beauty to the way Billie steadfastly faces the emotions on both songs. There’s no dulling of those expressions for the sake of saving face or hiding her darkest thoughts. And that wholehearted expression of utter hopelessness makes them all the more powerful. The album closer, appropriately titled “goodbye,” is just as quiet. On it, the hitmaker fashions the lyrics by borrowing one line from each song that came before. The piecemeal approach to songwriting results in an otherworldly if not as immediately affecting moment. That being said, it’s another tribute to Billie’s creativity and range. The end result is an impeccable debut album. Billie brings some of our darkest nightmares to life over the beguiling productions. Her voice acts as a guide and keeps us tethered to the shadowy world of her own creation. Through it all, she never once loses control. Instead, she leads the charge as she cycles through a variety of sounds. Impressively, there isn’t one moment that doesn’t feel authentic to the rising star. And listening to it raises an unavoidable question: How is it possible for our fears to sound so alluring? Possibly, they only sound that good in Billie’s more than capable hands.